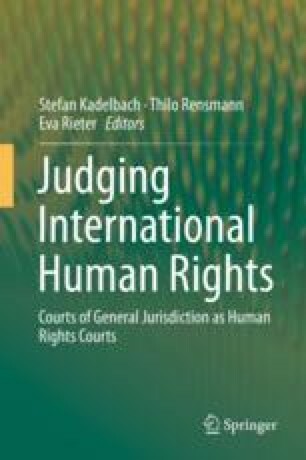 Focusing on a specific state may seem to be of limited significance in research on the implementation of human rights treaties because this topic should be a general agenda, in view of the universal character of human rights. However, the case study of Japan, which has the traditions of civil law and common law through its history, provides a number of universalizable suggestions by its sincere response to the difficulties common to other States in realizing international human rights. The present author appreciates the comments by the members of the ILA Human Rights Law Committee, especially Stefan Kadelbach, to the earlier draft. In researching laws in Japan, the problem is that there is no official translation of judgments, decisions and laws in Japan. Unless otherwise noted, all the translations of Japan’s laws are from http://www.japaneselawtranslation.go.jp/?re=02 (last access 10 Apr 2017), which is furnished by the Ministry of Justice, though the translation is not official. The translations of judgments and decisions are made by the present author, if so indicated.